Anti-transgender reparative therapy, deemed unethical by experts and banned by politicians, is based on unconfirmed evidence. Could it be the latest high-profile sexology scam? Last week Ontario banned anti-transgender reparative therapy, practiced for decades from an ideological home base at Toronto’s Centre for Addiction and Mental Health (CAMH). The ban was one of many enacted in response to transgender teen Leelah Alcorn’s suicide after being subjected to anti-transgender reparative therapy. Now the academic holdouts who support the practice are making their last stand in the court of public opinion, placing letters and op-eds in the Toronto Star, Los Angeles Times, and Wired. They always avoid mentioning their notorious published case report, the curing of eight-year-old Danny Ryan’s “childhood gender identity disorder.” Danny’s alleged cure has never been independently confirmed, and the whole case may be completely fabricated. To understand the unethical history of anti-transgender reparative therapy, follow the money. The Archives of Sexual Behavior was founded by sexologist Richard Green in 1971, and he made his clinical and editorial goal clear in his first issue: “the prevention of transsexualism.” Green’s team at UCLA was rewarded with funding for this goal. As described in Green’s book The ‘Sissy Boy Syndrome,’ his faction of sexologists basically believes gay people are born that way, but being transgender is a lifestyle choice that can be cured by subjecting young children to anti-transgender reparative therapy. Green’s hand-picked editorial successor Kenneth Zucker has subjected hundreds of children to government-subsidized “therapeutic intervention,” and he uses the Archives to promulgate his views. Though most gender non-conforming children do not make a gender transition later in life, clinics like Zucker’s at CAMH make money from anxious parents by diagnosing Gender Identity Disorder in children, a disease Zucker and friends created in 1980. 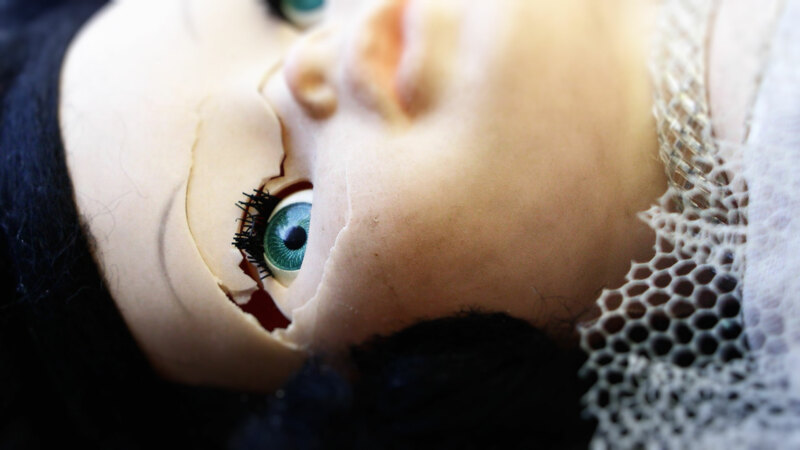 To cure it, Zucker developed a version of Green’s clinical protocols: parents must shame or punish feminine boys who play with dolls, make art using pink or purple colors, draw pictures of girls, or seek out girls as playmates. A 2008 academic panel discussed Bailey's book and the Danny Ryan case report. No journalist has ever investigated Bailey's claims that Ryan was cured of childhood gender identity disorder. 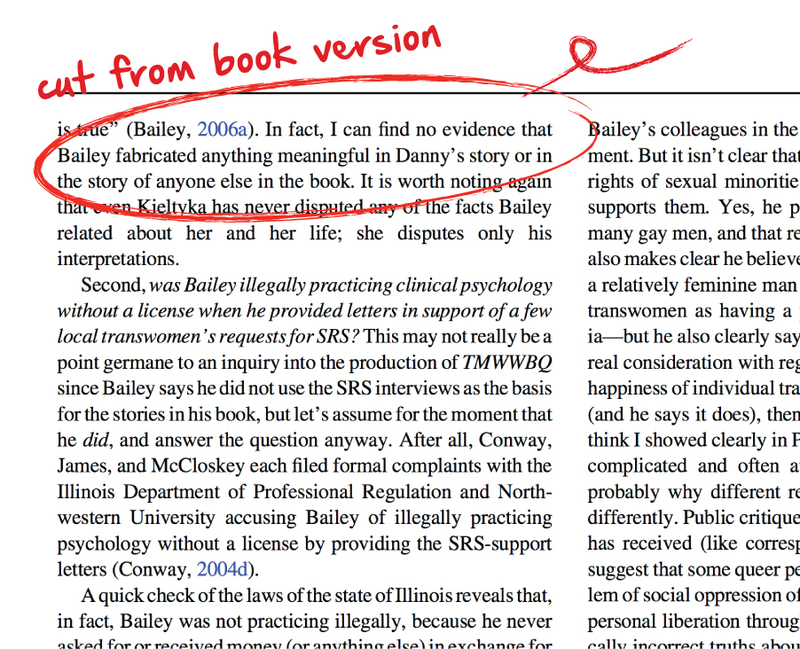 In 2008, Zucker devoted an issue of Archives to defending Bailey and attacking his transgender critics, anchored by a target article by Bailey’s friend and Northwestern colleague Alice Dreger. Dreger interviewed Bailey’s defenders on the Archives editorial board, but she talked to none of Bailey’s prominent critics, including me. 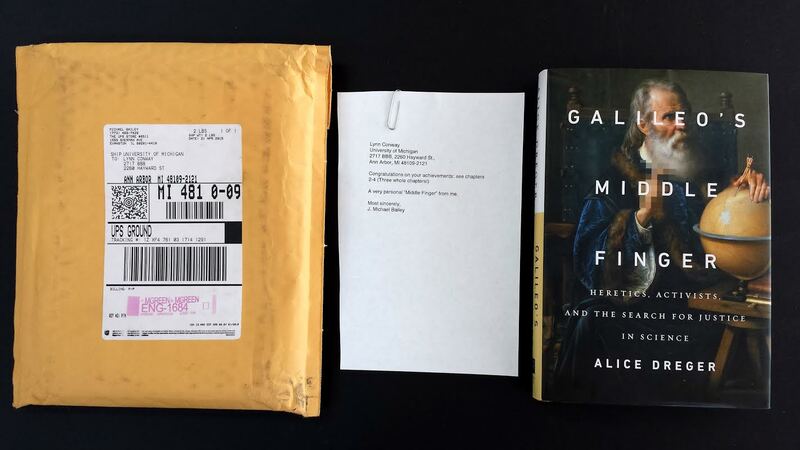 In March, Dreger repackaged her Bailey defense as the centerpiece of her new book Galileo’s Middle Finger. Despite her attempts to no-platform any dissent, she presents herself as an academic folk hero standing up for academic freedom against threats to science, like Bailey’s transgender critics. The Chronicle Review arm of the trade publication Chronicle of Higher Education even made Dreger their cover girl and wrote a glowing profile that suggested it’s “liberal dogma” to demand evidence for her published claims. Dreger’s new book is best understood as an anthology of emergent academic folklore, attempts to create lively master narratives chronicling brave academic heroes pursuing The Truth™ regardless of consequences, idealized academic essence narratives. Lessl hypothesized that this kind of folklore develops in service of institutional demarcation, or “us versus them” boundary work of the sort one might find in identity politics. They’re the kinds of stories academics share in faculty lounges and at cocktail parties: Grimm Brothers and Aesop for the intelligentsia, replete with dangerous monsters like fanatical trans women and heroic seekers of The Truth™ like Zucker, Dreger, and Bailey. What’s really at its heart is the pro-am turf war over the production of knowledge, where people like Dreger now must compete with thinkers outside academia. Dreger republished her defense of Bailey, most of it verbatim. What changed? Dreger quietly removed all her conclusions about the alleged Danny Ryan fabrication, without explanation. A fundamental aspect of any kind of research is to confirm facts about all the people involved and speak with all of them directly. Just ask Sabrina Rubin Erdeley. Since Dreger hypocritically pontificates in her book about the need for “evidence-based activism,” let’s examine the evidence for Danny Ryan. Everything we know about Danny Ryan comes from just one source: J. Michael Bailey. Dreger has never spoken with Danny, or Danny’s parents and sister, or Danny’s gay uncle, or the Northwestern student who introduced Bailey to Danny’s family. We are supposed to take Dreger at her word that we must take Bailey at his word. Danny was cured and is an out and happy gay man. If he exists, Danny is in his mid-20s. Wouldn’t it be ethical to confirm the existence of the Ryan family, whose members perfectly encapsulate Bailey’s beliefs about gay and transgender people? Danny Ryan has remarkable parallels to David Reimer, the infamous case report by Bailey’s ideological nemesis John Money. Reimer’s successful case report turned out to be a fabrication, and Reimer ultimately committed suicide. It also has troubling parallels to Kirk Murphy, the infamous case report of a child cured via anti-gay reparative therapy. Murphy’s successful case report turned out to be a fabrication, and Murphy ultimately committed suicide. The most troubling parallel is between Danny Ryan and Leelah Alcorn, the transgender teen subjected to anti-transgender reparative therapy. Alcorn committed suicide in late 2014, leaving behind two notes. Her hard copy note was thrown in the trash by her parents, but she scheduled the other to post online after she killed herself. In it, Alcorn said she wanted her suicide to mean something, begging all of us to “fix society.” That post was quickly deleted at her parents’ request, but not before it was saved and shared, quickly generating an international response. Dreger has compared children like Leelah Alcorn to a child she knew who wanted to be a train, all the time insisting she is an ally to transgender people. Bailey has been investigated twice, and his signature sexology course was taken away after he arranged a live “fucksaw” demonstration for students. In the wake of Alcorn’s death, the Obama Administration came out against anti-transgender reparative therapy. In early 2015, Zucker’s employer announced they were bringing in an external expert to review Zucker’s clinical practices. Zucker’s medical director Kwame McKenzie announced they have stopped accepting new patients to its Gender Identity Services clinic for youth because of outcry from the public and the newly-enacted ban. Someone sent Dreger's book to noted scientist Lynn Conway, who is attacked in several chapters for criticizing Bailey's methods and teachings.The attached note says "A very personal 'Middle Finger' from me." Can an entire academic journal be corrupt and unethical? Dreger claims that professional bioethicists ran an unethical journal, so is it possible that her like-minded friends at the Archives are unethical, too? Zucker has a self-evident conflict of interest in defending Bailey. Academics have noted that Dreger had a self-evident conflict of interest in defending Bailey. As evidence of their sociopathic trolling of their trans critics, someone mailed key Bailey critic Lynn Conway a copy of Dreger’s book that omits Dreger's role in vetting the Danny Ryan case report. The note and mailing address say they're from J. Michael Bailey. Academics continue to claim transgender activists are persecuting them, but who has the power here? Gender-variant children, or academics like Zucker, Bailey, and Dreger? Academics don’t get assaulted and murdered so frequently that journalists rarely cover the crimes. Children who say they wish to teach college someday aren’t subjected to shaming, aversion therapy, and parental punishment supervised by clinicians. David Reimer is dead by his own hand. Kirk Murphy is dead by his own hand. Leelah Alcorn is dead by her own hand. Can Danny Ryan and the children like him be saved? Dreger sells what credulous academics want to believe and what lazy journalists and editors want to report. They’re uncritically giving these academics platforms while transgender children are committing suicide. I’m not going to name and shame yet, but those same journalists have been unwilling to give equal time to those of us who question the legitimacy of Zucker, Bailey, and Dreger’s evidence. I’m issuing a clarion call for evidence-based activism, because history has shown that some academics can’t be trusted to tell the truth. I’ll believe Zucker, Bailey, and Dreger when I see independently confirmed evidence that the hundreds of Danny Ryans subjected to anti-transgender reparative therapy did not end up like Leelah Alcorn. Brown University researcher Lisa Littman has become the latest cause célèbre for academic freedom grifters after publishing an irresponsible article promoting “rapid-onset gender dysphoria,” yet another disease model of gender identity and expression. Imagine a disease called “rapid-onset homosexuality” to understand the problem with “ROGD.” Now all the usual suspects are defending her biased garbage. Two new laws that allow California residents to officially change their gender identification went into effect this past Labor Day weekend.